Israel Army IDF MLRS Unit Insignia. 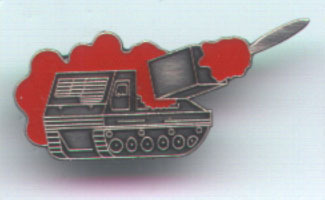 Product Title: Israel Army IDF MLRS Unit Insignia. Israel Army IDF MLRS Unit Insignia. The Israeli Artillery Corps is the Israel Defense Forces corps responsible for operating the medium and long-range artillery network. The corps is known as the "Pillar of Fire" which moves ahead of the camp. In the framework of the integrated battle, the role of the Artillery Corps is to concentrate the firepower on land. The corps maintains an extraordinary firepower and is known as one of the most technologically advanced field corps. Its designation is defined as "paralyzing and destroying enemy forces by exerting firepower in land battles." Sholef 155 mm self-propelled howitzer on a Merkava tank chassis Sholef 155 mm self-propelled howitzer on a Merkava tank chassis The corps is placed in-charge of two principal tasks: assisting the maneuvering forces, in the time, place, and firepower needed. Its second task is the paralyzing and destroying enemy forces deep inside the land battle.